Curing is the process of keeping a mortar or render under a specific environmental condition until the chemical set (referred to as hydration) is sufficient to withstand the environment into which the mortar has been placed. Lime binders are generally weaker than cements taking longer to acquire their strength and hardness, leaving them potentially more vulnerable for a longer period than cement equivalents, and curing them once placed is simply regarded as best practice. Good curing is typically considered to be that of providing a humid environment stimulating full hydration of the lime binder, providing strength development along with other quality benefits to be had from using lime. Conversely, and the most common cause of failure in our experience, is allowing a mortar/render to dry out too quickly, impeding the chemical process for hydration, stressing the mortar resulting in cracking, especially to renders. General view of Hessian sheeting attached to the inner uprights of a typical inside board scaffolding. Summer working with the Hessian dampened down to aid the curing regime. 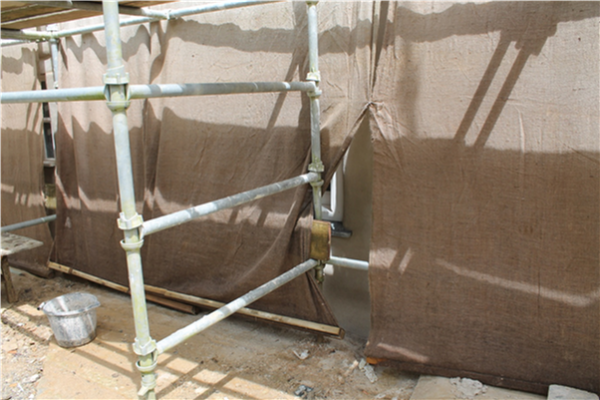 Standard practice for protecting lime renders is with Hessian sheeting draped over the subject area in relatively close proximity to the render. This should be left in place for at least a week and while this is a standard requirement for any kind of rendering it’s one that is regrettably seldom practiced. Cornish Lime stock three grades of hessian; 229, 273 & 366 gsm (grammes per m2) where the weight is relevant to the weave and amount of fabric used per square metre. The most commonly used for curing is the 229 & 273 gsm, the heavier fabric is more generally used for frost protection. Where a render is allowed to dry out too quickly hydration and carbonation of the binder is inhibited, resulting in drying shrinkage. There are two principle types of drying problems both of which will be manifested as cracks. The first, plastic shrinkage is the consequence of the rapid evaporation of mixing water from the mix (while in its plastic state). This leads to increased tensile stresses at a time when it has not gained sufficient strength. Plastic shrinkage cracks will be manifested in the first 48 hours. The second, drying shrinkage is from the effects of climatic conditions such as wind, high temperatures or exposure to strong sunlight (compounded during times of low humidity). Cracking from drying shrinkage tend to take that much longer to manifest but the outcome is much the same. Another consequence of rapid drying is that the mortar may become friable. The consequences of too much water in a mix can compound the plastic shrinkage, which as previously mentioned is likely to be manifested in the first few days following application. Water in a mix takes up volume and is given up during the hydration process. The consequences of applying subsequent coats of render coats too soon onto the previous coat may result in stress cracking as a result of unequal contraction between the two layers (differential drying). We advise that the backing coat should be allowed to achieve a sufficient set prior to applying additional coats. The application of excessively thick top coats can result in stress fracturing in the coat as a result of unequal compaction when finishing the render coat. The purpose of floating (rubbing up) is primarily decorative; however, it performs a technical function, closing the surface in this manner helps reduce the ingress of water. Also where a top coat is too thick it will be extremely difficult, often impossible, to compress the whole thickness to an adequate let alone an even level. As well as supplying Hessian and a range of ties etc. Cornish Lime also supply a Wintermix product as part of our Cornerstone range. Please contact us for further information on this product or further advice on curing lime mortars and renders. For high suction backgrounds especially we advise the addition of a proprietary polypropylene or fiberglass reinforcing fibres added to the mix as an aid to control shrinkage cracking in the base coats. I’m putting lime render on internal mudbrick walls and I want the final surface to be very stable (ie no powder / dust / sand grains coming off). I’ve been told that frequent misting is the key to achieving this. How often should I mist? And for how long? And should I taper off the frequency of misting? The air temperature ranges from 16-22 deg C. The final coat of render is one and a half parts lime putty made with hydrate lime to 3 parts fine double-washed beach sand applied with a steel hawk. As well as frequent misting, is there anything else I should be doing to achieve a stable surface? Misting can help and will certainly help aid the curing of the plaster, which in turn can help limit the dusting. There is no hard and fast rule to misting as there are several variables, such as temperature fluctuation, relative humidity, substrate condition and moisture content within the substrate. We would recommend spraying for the first 3 to 5 days, depending on temperature and background suction, you will probably find that the amount/frequency of spraying can be reduced over time. However it is worth mentioning that all lime plasters are prone to dusting. Thanks very much for your answer, Adam. I've been misting about every hour or 2 on the first day (but not between 10pm and 6am) and then gradually reducing misting frequency and stopping after 2 weeks. Is this overkill? I've also been experimenting with different sands and different ratios on different substrates and different use of tools. After about a week none of the trials has much dust coming off, but three trials have developed hairline cracks. I've put this down to the fact that the final lime render coat was too wet, there was too much beach sand which is very fine and not sharp, and that the infill coat underneath was mud (clayey with coarse washed river sand in but no lime). The mud coat is quite thirsty, although I did mist it thoroughly several times before putting on the final coat of lime render. I have been rendering a stone property with nhl3.5. I applied a harl coat first mixed 1:1 and am now applying the scratch coat at a mixed ratio of 2.5:1 with fibres added.I am thoroughly wetting down the walls before and during application however I find that the scratch coat cracks as it is drying. Some say I should not be concerned about this coat cracking, however the last wall I rendered in line back in the autumn hardly cracked at all? It is difficult to say without knowing the brand of lime, the type of sand and the exact substrate you are working with. A common cause of cracking is excess or rapid moisture loss or the render drying too quickly. I know that you have said you are dampening the background and the render but you may find with the heatwave we have been experiencing of late that both the background and the render require more dampening than usual. Also if you are working in direct sunlight this will speed up the drying time significantly. 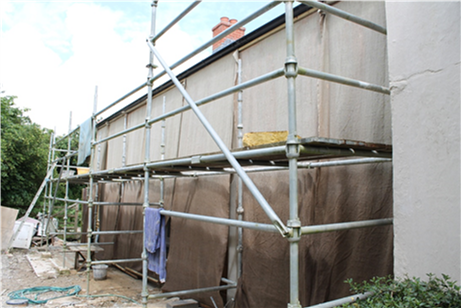 I would recommend dampening the background more before applying the render, ensuring that the render remains damp once applied and protecting it from sun by using hessian. As i am unable to see the cracking i cannot comment as to whether the render is compromised, if you only have isolated or minor shrinkage cracking (less than 1 mm) you may be ok, if the cracking is deeper/larger and/or extensive than this, the render may be compromised. We had a lime render applied to our exterior wall 2 months ago & sections near ground level and an adjoining garden wall are still damp today. The rest of the wall is curing well. How long should I expect for this to dry out? What material was used for the render (i.e. lime putty or NHL)? Also is there any hard standing ground near the render itself? Sometimes when a render is close to or meeting with the ground level it can pick up considerably more water/moisture at this section. If you are able to send us any photos that may also help. Due to the previous cement render there will likely be a higher moisture content within the wall and this can take a while to dry out. You may also find that moisture can enter as you have hard ground next to the render, rainwater can be thrown off the ground and into the render. I would just keep an eye on the wetter section, but it should start to dry back over time. Hi, Ive recently rendered with nhl 3.5, harl coat first, then 2/1 lime sharp sand, then 4/1/2 sharp, soft, lime. Ive got crazing in certain areas but its hairline. Ive advised a limewash to finish but the architect doesn't want it. Ive never left lime render without limewash, should I insist on it as I know that it will give added protection? Apologies for the delayed reply, I have been out of the office for 3 weeks. Ideally a lime render should be painted to provide protection, that said it doesn't have to be done straightaway. If there are signs of hairline cracks on the render we would advise that it is painted, as the paint will help to mask the cracks and also protect the underlying render. A limewash could be used, or you could look to use a Beeck mineral paint. The Beeck mineral paint will provide a much greater long term protection as it works by chemically bonding with the render and should achieve a lifespan of 10 plus years based on a single application. The mineral paint will also mask the cracks and offer water repellent finish, reducing water ingress by up to 95% and still remain as vapour permeable as a limewash. If you want to discuss this in more detail please contact me on 01208 79779 and i can discuss the various options available. Thanks for taking the time to reply. I’m guessing it’s just the moisture escaping from the wall behind? I’ll just remain patient but looks like it’s going to be well into next year before it’s dry at this rate. Think I will reinstate the plastic sheeting for any upcoming frosty periods. Looking to repoint a small section of house (1955) using nhl 3.5. Appreciate its not the ideal time of year however would like to avoid damp getting into internal walls. Temperature is forecasted for 5-6 degrees and I'll be protecting the mortar with a tarp and hessian placed together for around 2 weeks. Firstly do you think this will work and be adequate and secondly would you recommend still misting? It is difficult to say without knowing the substrate and exposure of the building but providing the pointing is protected from winds, rain and frost it is still doable this time of year. I would recommend protecting the mortar for 3 to 4 weeks as a general rule, the mortar will need to kept free from frost for around 3 weeks. The issue with this time of year is when the temperature drops, this slows the setting time of mortar and if moisture is within the mortar there is a risk this can get caught by frost, it is recommended that lime mortars are used in temperatures of 8 degrees and above. So whilst work is carried out this time of year, there is an increased risk of failure. The mortar will require spraying/misting to prevent it from drying back to quickly, the amount of misting will be specific to each job, but pay attention to moisture levels, humidity and rainfall, if there is more moisture in the air/substrate the mortar may require less misting now compared to if the work was carried out during the summer (although this is not a hard and fast rule). Smaller sections will be easier to manage and protect, but unfortunately there is no guarantee with this time of year.